As the Walt Disney World Resort continues to grow and attract new visitors they are finally adding much needed attention to one of my personal favorite areas, Adventureland. I have always felt the Magic Kingdom version of Adventureland has always fell short of that in Disneyland. And with the addition of the Aladdin Carpets, it was truly a bust. Now this may not be the answer either, but at least it shows growth, and I have been hooked already since the re-birth of the Original Enchanted Tiki Birds returned. 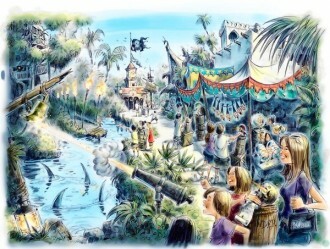 This spring it seems Adventureland will get more fun and interactive with a Pirate Twist to it. It only seems fitting given Pirates are a boys Princess. The attraction ill be called “A Pirate’s Adventure: Treasures of the Seven Seas”. So far much hasn’t been leaked out about this, but with the success of Jack Sparrow in Hollywood Studios it seems fitting to help pump up that area. According to the Disney Parks Blog it will have visitors helping Captain Jack Sparrow on a quest using a “Magic Talisman and Map” to complete five pirate raids within Adventureland. So far many of Disney’s interactive adventures have been fun for kids and adults alike and this one is sure to be a hit. With attractions in the area as Pirates of the Caribbean, Swiss Family Treehouse, The Enchanted Tiki Bird, Aladdin’s Magic Carpets and the Jungle Cruise, there is much to work off of. I for one am excited as my children are wanting to do this.